In Quick Glamour Part 1, I took the photo pretty far in just 5 minutes. Now, I am going to go just a little farther in another 5 minutes. If you notice, the left eye is squinting. This is a simple fix using the Liquify Filter. The Liquify Filter opens a new window with a special set of tools. The first tool in the upper left is the Forward Warp Tool. I used a nice big brush of 109 pixels positioned just above the left pupil to pull the eye open to match the right. Using this tool, I also pulled the edges of the eyes in (towards the pupil) just a little to further reduce the squint in both eyes. While I was at it, I made the smile a little happier by raising the edges of the mouth. 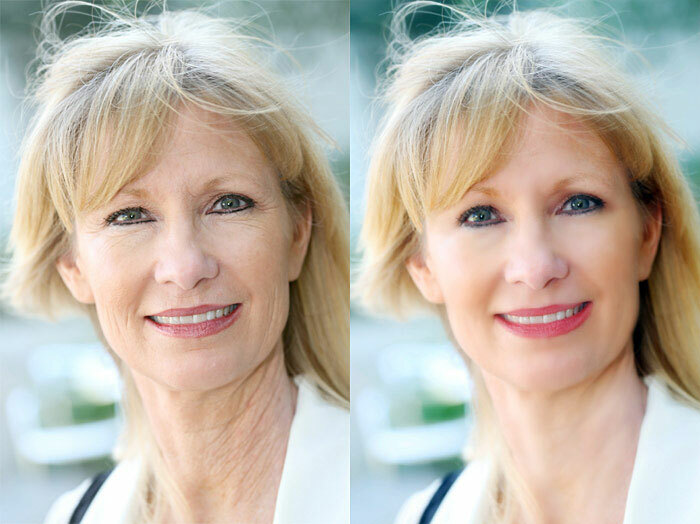 You can compare the changes in the Before & After image above. A soft glow is very common in glamour shots. In camera, the effect is created by filters or special lenses directly on the recorded shot. But, it can also be created in Photoshop after the fact. Start by duplicating the revised image with the Liqified effects. 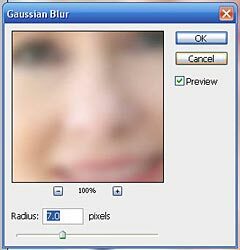 Select the Gaussian Blur with at least a 7 pixel radius and apply it to the duplicate layer. Change the Layer’s Blend mode to Soft Light. The blur softened the eyes, but we can fix it. Add a Layer Mask to the blurred layer. Using pure black and the pen tool with a brush size of approximately the size of the pupil. 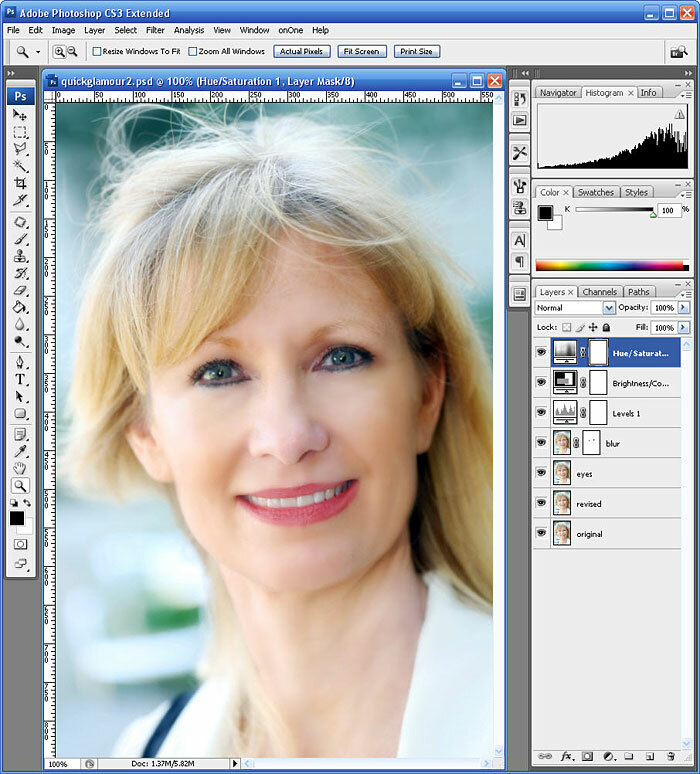 In the layer mask, draw in the eyes to remove the blur. I could stop here, but I want to do just a little more. Add an Adjustment Layer for Levels. Click the “Auto” button and then drag the middle carat to the left just a little to lighten the overall image. Add an Adjustment Layer for Brightness/Contrast. Set the Brightness to -25 and the Contrast to +25. Add an Adjustment Layer for Hue/Saturation and set the Saturation to +15. You can see the final Photoshop file with layers below.